Despite the fact that he was previously announced as one of the musicians taking part in the Rock 'N' Roll Allstars tour, former METALLICA and VOIVOD bassist Jason Newsted will **NOT** be making an appearance at the event. 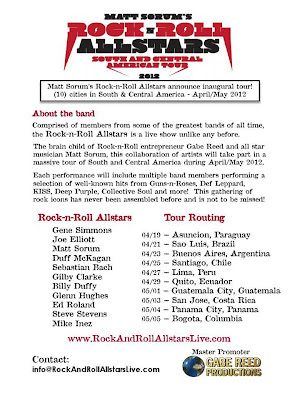 Promoter Gabe Reed hosted a press conference earlier today (Thursday, March 1) at The Roxy Theatre in West Hollywood, California to officially announce the Rock 'N' Roll Allstars tour of South and Central America in April/May 2012. Also attending the press conference were Simmons, Sorum, McKagan, Clarke, Bach and Hughes, among others. Would be cool if Duff, Matt and Gilby shared the stage for the GNR songs. Funny that they had to fill in Sebastian Bach's list with other people's hits so his one didn't seem lonely. Well, technically He has two hits on his set. Youth Gone Wild came before I Remember You. I wasn't really counting I Remember You. Seriously though, this'd be really cool. Baz aside, I'd definitely check this out. I don't remember "I Don't Remember You" I just know 18 and Life, and Youth Gone Wild. Oh well, looks like Baz will finally get his dream of playing with VR lol maybe it will be an audition of sorts? 18 And Life is the only Skid Row song I ever liked. It'd be worth it just for the epic jams. Quit being a Baz Hater! He was really good LIVE when he was younger. I know for a fact, they blew Bon Jovi off the stage when they toured together. For the most part, the line-up is not interesting at all IMAO. Yes in '89. Very memorable. I saw Skid Row twice after that and their performance was not that great. Similar to what I have experienced with Slipknot, Slayer, Motley Crue, Megadeth, Metallica and so on and so forth. Huh. I saw him in 2010 and cringed the whole time. Check out the Ludwigs for RNR Allstars. We have landed safely in Paraguay! See you at the kickoff of the tour tomorrow night! just found out we wont be going to Brazil. Show is cancelled ! sorry Brazil, wish we could have been there.spending the day off in Paraguay. "Rock N' Roll Allstars are saddened to annouce the cancellation of our performance at Metal Open Air Festival in Sao Luis, Brazil. We regret not being able to attend. We are in South America and are ready to rock, but the circumstances are beyond our control: We were informed before flying to Brazil today that many other artists have pulled out of the event, as well as local security. We are very concerned for the safety of the fans and artists whom are already at the festival. We are receiving confirmed reports from other bands and friends on the ground that the event is dangerous and a disaster. Please be safe, and we look forward to rocking for you in the future.